Filed to: Where'd The Water Go?Filed to: Where'd The Water Go? When Hurricane Harvey dropped up to 60 inches of water over southeastern Texas, who would have guessed the state would be experiencing a drought less than half a year later? Certainly not John Nielsen-Gammon, the state climatologist and a professor at Texas A&M University. He’s been Texas’ climatologist for nearly 20 years, and he didn’t expect a drought to follow Hurricane Harvey. That being said, it’s not like he’s exactly surprised, either. After all, drought is a normal occurrence in the state. This type of event typically follows La Niña, and that’s what the Tropical Pacific is currently experiencing. During La Niña, which sees a cooling effect throughout the Pacific, Texas sees drier and warmer conditions. That means less rain. The thing that gets Nielsen-Gammon, however, is that the dry winter extends back to September. La Niña, on the other hand, doesn’t begin until November. “La Niña doesn’t typically affect our weather that time of year,” he told Earther. And this winter dry spell has lasted quite the while in some parts of the state. 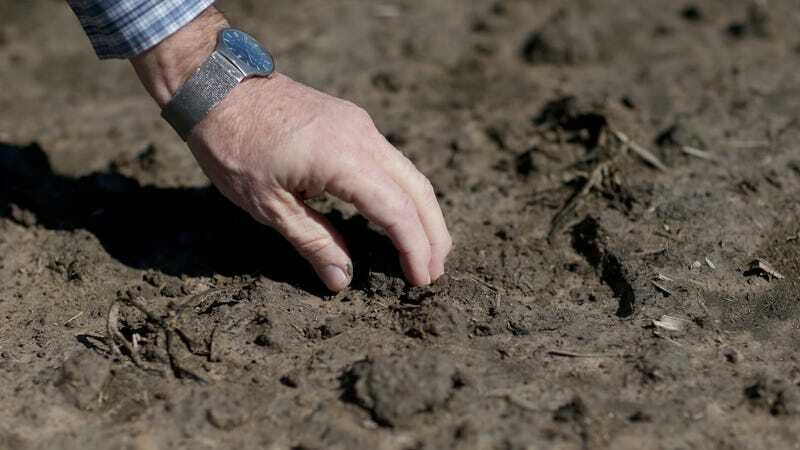 In North Texas, barely any rainfall has hit the soil in more than 100 days, according to the National Weather Service. The region is so dry that it’s under a wildfire warning. These are parts of the state that missed the wrath of Hurricane Harvey. However, the Beaumont-Port Arthur area, where Harvey rainfalls broke previous records, hasn’t been so lucky to miss the drought’s wrath (it’s in moderate drought). Nearly 50 percent of the state is in drought right now, according to the U.S. Drought Monitor. When including regions that are “abnormally dry,” that number jumps to 85 percent. The statistics are a stark contrast to the conditions last year around this time when most of the state was in the clear. It’s too early to know how the drought compares to the historical trends, but Nielsen-Gammon says it’s not particularly unusual. And don’t go pointing to climate change just yet. A connection isn’t clear, especially given the impacts from La Niña, but climate change will make Texas droughts more common. The drought is hurting one sector in particular: agriculture. The winter wheat farmers planted in the fall is having a hard time growing without any rain, Nielsen-Gammon explained. And ranchers are turning more and more to hay to feed their cattle instead of the grass that should be sprouting more lusciously. Texas can expect to experience more droughts as the effects of climate change become more pronounced, but will the rain help counter the dryness? That’s unclear, said Nielsen-Gammon. What he does know is that we’re likely to see more extreme events like Hurricane Harvey, but that doesn’t necessarily remediate drought. At a certain point, the soil stops absorbing the rain, and it just runs off into streams or rivers. It’s of no use to farmers and ranchers who really need frequent rain patterns instead of just one giant bucket load. That’s the reality for Texans today, and the uncertainty is just beginning. Harvey killed 68 people, and 500,000 cars flooded, according to a new federal report. People are still dealing with those impacts nearly five months later. Now, they’ve got a drought to deal with, too.